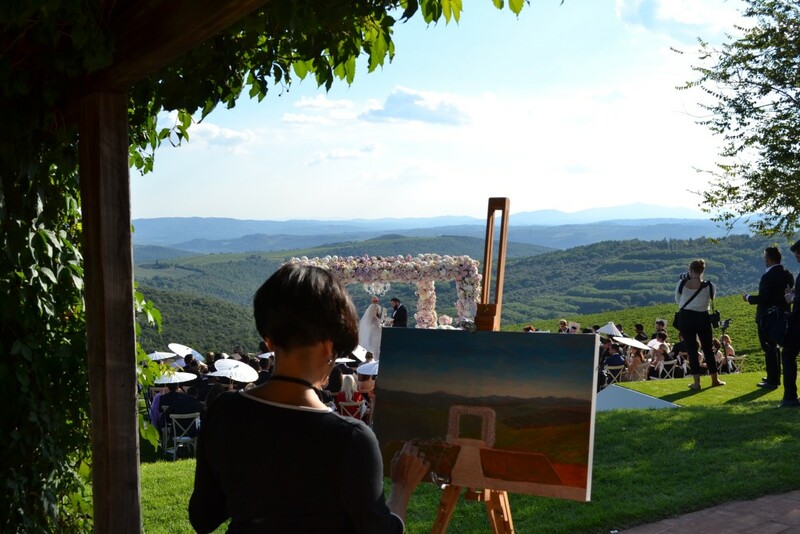 Live Event Painting In Italy is a specialty service where a fine artist paints the scene around them as the scene is happening. Caridad Barragan paints your wedding celebration, reception or corporate event as it takes place, right before your guests eyes. The painting usually includes the bride & groom, the reception room and details, and renderings of important guests. Live Event Paintings are all about elegantly capturing your dreams, your day on canvas while entertaining your guests and creating a one of a kind keepsake memory of your special moment. Have a look at my FAQ below and if you have any further questions, drop me a line. Thank you! WHEN SHOULD I BOOK MY DATE? As soon as possible. Dates are reserved on a first come first serve basis. A 50% deposit is required. MAY I CONSULT WITH YOU BEFORE MY WEDDING DATE? Yes, I offer a detailed consultation approximately 1-2 months before the event to make sure the final painting meets your vision. WHAT TYPE OF MATERIALS DO YOU USE? I use only the finest professional Italian acrylic paints on stretched canvas. DOES HE PAINTING COME FRAMED? The painting is on a stretched canvas which can be hung right away without a frame. I do not make my own frames but can consult with you about framing options, and can also have your painting framed in Italy for you for an additional fee . WHAT DOES THE ARTIST REQUIRE DURING THE EVENT? I will bring all of the necessary materials: paints, brushes, easel. I do need a space of about 6ft. x 6ft. (2m. x 2m.) in order to work comfortably and have your guests enjoy the painting process. My work area also needs to have a free view of the scene I will be painting. I will also need an electrical outlet for my easel lamp. CAN MY GUESTS TALK TO THE ARTIST DURING THE EVENT? Absolutely! It’s always a pleasure to engage with your guests. Many people have never seen a painting take place before and I understand how special this can be. HOW MANY HOURS DO YOU PAINT DURING AN EVENT? I like to get started 3-4 hours before the start of an event in order to set up my painting area and get an initial sketch in so by the time your guests arrive they can see that the painting is starting to appear. I will paint 4-6 hours during your celebration. HOW MANY PEOPLE CAN I INCLUDE IN A PAINTING? I do not have a set limit or charge more per person, but I recommend not requesting more than 6-8 specific recognizable people as it can be difficult to get more than that many in during a typical event, and including too many people makes it more difficult to include specific decor details like cake or tablescapes. Additional people/details can sometimes be added after the event though. Most people can be identified in my paintings by key features such as hair color and clothing, but I do keep the faces of guests other than the bride and groom (or other VIP guests) painted a little more loosely so as to keep the focus on the most important people, and to preserve a sense of motion in the painting. MY VENUE WILL ONLY LET YOU SET UP AN HOUR BEFORE THE EVENT. WILL YOU HAVE ENOUGH TIME TO SET UP? Though arriving 3-4 hours in advance is ideal, I only need about 20 get everything set up to start painting. However, if I can arrive earlier, then guests will be able to see a background that is close to finished by the time they come into the room, and I will be able to focus more on adding the people during the party. Anything not completed at the event will be finished in my studio. HOW CAN I BE SURE THAT I WILL BE HAPPY WITH MY PAINTING? I offer touch-up work (usually about 5-10 hours total, plus two rounds of revisions upon request) at no extra charge to make sure you are completely satisfied with the final painting. DO YOU HAVE PROOF OF INSURANCE? Yes, I have standard liability insurance covering up to €500,000. WHAT IF MY EVENT ALREADY PASSED? In the past, I have created many customized paintings based on photo or video documentation of an event. This also allows me the flexibility to not just copy directly from one photograph, but collage multiple memories from your event. You can choose a size and style that fits your budget. CAN YOU DO MORE THAN ONE PAINTING DURING AN EVENT? I can create several small paintings or drawings of different moments at your event, or a live painting and then several other paintings based on photos. Though I normally only do one large painting onsite. WHEN WILL MY PAINTING BE READY? The majority of the painting will be created live at your wedding or event. Afterwards, I will take it back to the add the finishing touches. It will be ready after 6-8 weeks and I will email you a preview of it. Once you’ve viewed and approved it, I’ll ship it to you via express courier. DO YOU TRAVEL? I am based in Umbria (central Italy), about an hour north of Rome and will travel to any destination in Italy, the Mediterranean and Europe. If you have any questions, please let me know, I’ll be happy to answer.